Have some apples to use up from the orchard? Make these Easy Caramel Rolls with apples. They have apples, cinnamon, and caramel in every bite! I could stop right there, and everyone would be happy, especially at our apple-lovin’ house. Except I need you to know how ridiculously simple these Easy Caramel Rolls with Apples are to make. Sure, you need to wait for them to get nice and fluffy before you bake them, but that can happen while you are sleeping. So if waiting is the hardest part of these caramel rolls, sign me up! 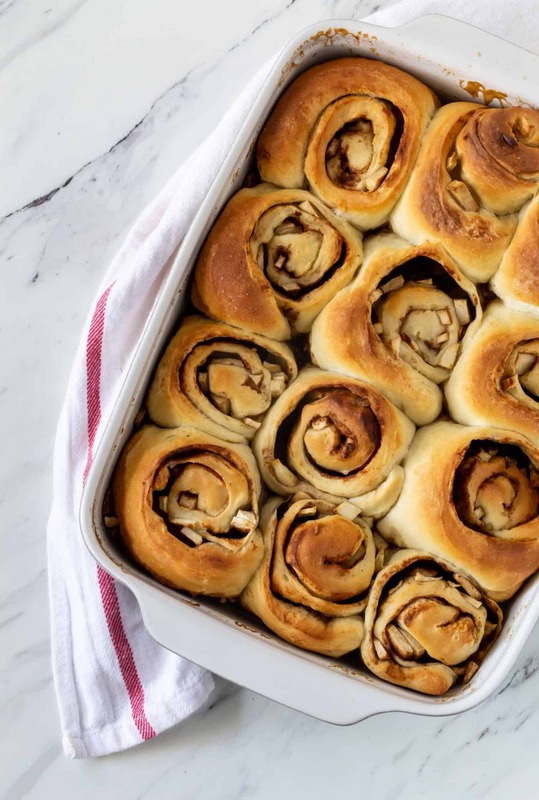 What makes these caramel rolls so easy? To start, I used thawed frozen sweet dough. That one simple shortcut cuts prep time because you don’t have to futz with yeast. Then the rest of the ingredients are pantry staples, including our favorite Kerrygold® Butter that we always have on hand. No need to run to the grocery store for single-use ingredients! And although the caramel sauce tastes rich and decadent, it comes together in minutes. What if I forgot to start the caramel rolls last night? No worries! You can still make them the same day; it just takes a little longer. This recipe is really forgiving. Simply wait until the rolls have doubled in size and then bake them for 30 minutes. 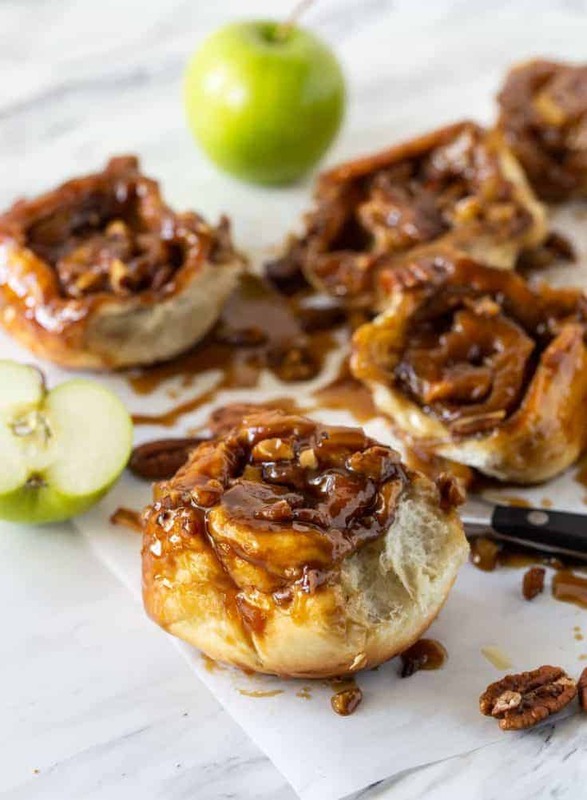 Can I make these caramel rolls without the apples? Sure, you can if you don’t have any apples on hand, but the tart granny smith apple is a great complement to the caramel sauce. And don’t worry, any kind of apple works. Use your favorite! Are you drooling yet? If you’re not, we need to talk. Because these Easy Caramel Rolls with Apples are worth every single calorie consumed. 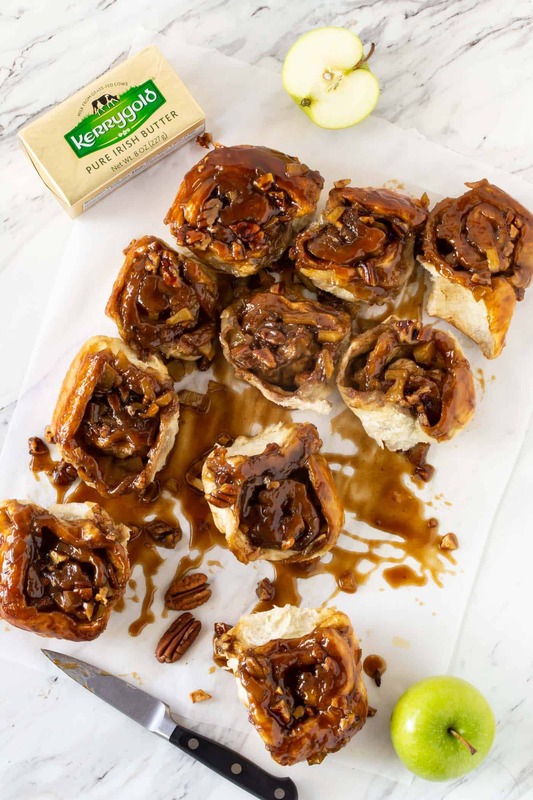 Each bite is loaded with little bits of apple, cinnamon, caramel, and crunchy pecans, which in my book translates to absolute perfection. Caramel-y apple-y goodness. The perfect brunch (or anytime) treat. Apple season is one of our favorites! Check out our some of our tastiest ways to eat them! 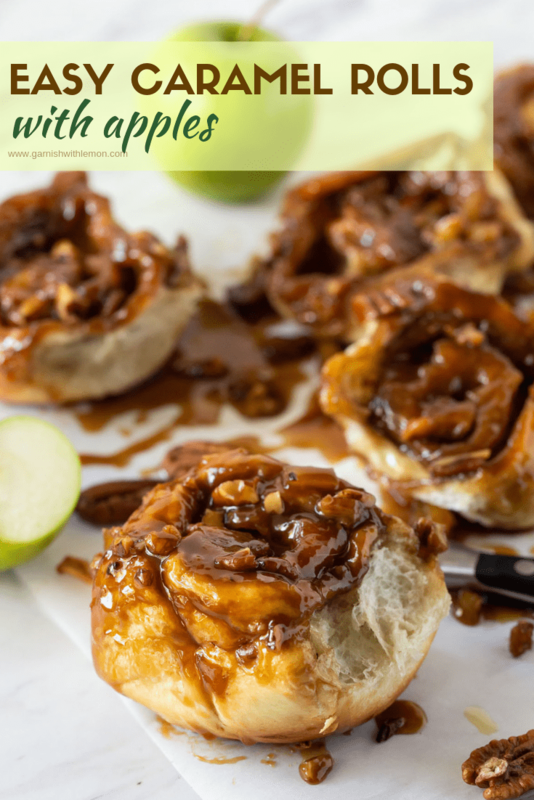 These Easy Caramel Rolls with Apples are the perfect addition to your next brunch! 1. Thaw dough according to package instructions. 2. Spray a 9 x 12 baking pan with cooking spray and set aside. 3. When dough is thawed, roll out to a 12 x 16 rectangle. Spread 2 tablespoons of the softened butter on top of dough and then evenly sprinkle with 3 tablespoons of the brown sugar, 1 teaspoon cinnamon and apples. 4. Starting from the shorter side, roll the dough up jelly roll style being sure to get all of the apple pieces inside. 5. Once completely rolled, use a serrated knife to cut into 9 equal pieces. 6. In a small pan melt 8 tablespoons of butter and add 1 cup brown sugar, stir until sugar is dissolved and whisk in 1/2 cup heavy cream. 7. Pour sauce in the prepared pan and sprinkle 1/2 cup chopped pecans on top. 8. Place rolls on top of caramel sauce. 9. Cover and place in refrigerator overnight. Rolls should be double in size in the morning. 11.Preheat the oven to 350 degrees. Bake rolls for 30 minutes. 12.Let the rolls cool in the pan for 10-15 minutes and then invert onto parchment paper. Serve warm. Do you have a link to a “frozen sweet dough”? I am new to that as a product…. I use the Rhodes frozen sweet dough. Check their website for a location near you! https://rhodesbakenserv.com/ Good luck!